The Nimbus-4 BUV Level-1 Dark Current Study Master Data is derived from the BUV Level 1 Radiance (RUT) product and contains the geophysical indices and classification, geographic and geomagnetic coordinates, solar magnetic parameters and angles; monochromator and photometer pulse count and analog data, and energetic trapped particles. There is one-to-one correspondence between this product and the dark current working data files, the difference is the working product data have been filtered. The data were originally created on IBM 360 machines and archived on magnetic tapes. The data have been restored from the tapes and are now archived on disk in their original IBM binary file format. Each file contains about one orbit of data from the nighttime descending node. The data files consist of 140 4-byte word records which are blocked with up to 25 records. The average size of an orbit file is 480 kB. This product was previously available from the NSSDC with the identifier ESAC-00045 (old ID 70-025A-05H). 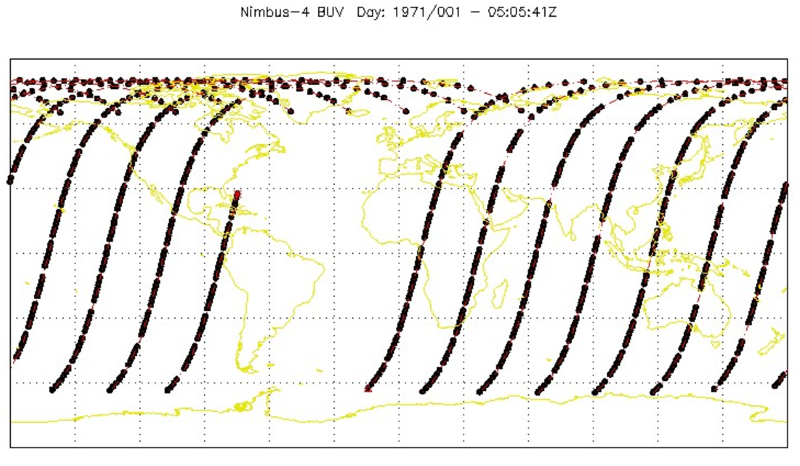 The data should be used with care and one should first read the Nimbus-4 BUV Dark Current Study document, as well as the Nimbus-4 User's Guide, section 7 describing the BUV experiment. Users should cite this data product in their research. Created by: Stassinopoulos, E. G.